You have a lot of demands on your time, deadlines, and commitments to meet – both in your university life and in your private life. Part of being successful at university and beyond is being able to prioritise what you have to do. The Eisenhower Matrix from Steven Covey’s ‘The Seven Habits of Highly Effective People‘ can help you determine where to best spend your time by deciding what is important and what is urgent. Think about all the things you spend time on – or need to spend time on. Now, think about where you’d place each one of those activities in the matrix below. These things have to get done, and they are both important and urgent, e.g., crises, emergencies, last minute cramming for exams, looming deadlines. Be aware that spending too much time here can increase your stress levels and is unsustainable over time. Spend most of your time here. These things help you to achieve your goals in a manageable and sustainable way. For example, exercise, health, building relationships, strategic planning and goal setting, reviewing class notes and readings. They help to improve your physical and mental health. These tasks are urgent, for example, phone calls, emails, interruptions, busywork. It can be tempted to spend a lot of time on them, but don’t be deceived; they are not important and don’t deserve a lot of your time. They are time leeches, limit how much attention you give them. These things are what you probably use for procrastination. For example social media, binge-watching TV, surfing the internet. Don’t spend much time here at all. Aim to spend most of your time in Quadrant 2 and plan your time so this is possible. Spending too much time on activities in Quadrants 3 and 4 will inevitably lead to you having a lot of things to do in Quadrant 1, which will raise your stress levels and ultimately lead to lower productivity and enjoyment. 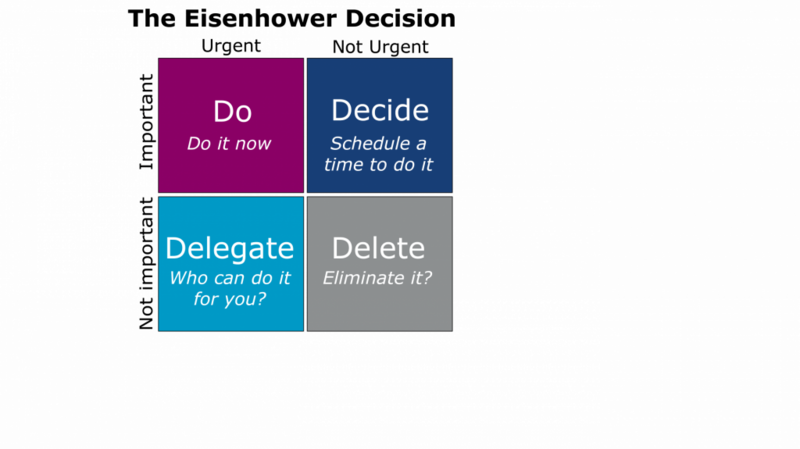 Watch the following brief video (2.24 mins) for further information on how to manage your tasks with the Eisenhower Matrix.